The 10th ICORIA 2011 was an exciting conference in an exciting city with 102 high quality presentations. Participants from more than 22 countries attended the conference. Please click the following link to download some impressions from the 10th ICORIA 2011 (download slideshow). Now, EAA is looking forward to the upcoming conference publication Advances in Advertising Research (Vol. III) with a selection of papers from the 10th ICORIA. Invitations to the authors will be sent out soon. The conference chairs Martin Eisend and Tobias Langner thank all participants for their attendance in Berlin and the EAA organizing committee for their support. As in every year, ICORIA ended with the General Assembly which was held on June 25th. The EAA members voted Edith Smit for President elect. 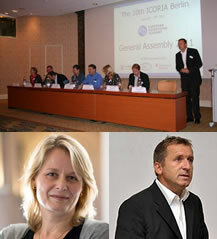 Edith will follow Ralf Terlutter as President of the EAA in 2013. As a successor of Edith, Tobias Langner took over the position of EAA Information Manager. Furthermore, Martin Eisend has been elected as a member of the EAA board. The second volume of the annual EAA publication series Advances in Advertising Research has been released. 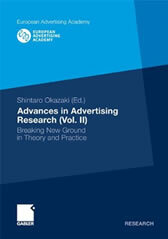 Advances in Advertising Research – Breaking New Ground in Theory and Practice, edited by Shintaro Okazaki, presents a selection of research papers presented at the 9th ICORIA which was held in Madrid, Spain, on June 24th-26th, 2010. The book series Advances in Advertising Research is published by Gabler Research and can be ordered here. The 11th ICORIA will be held on June 28th-30th, 2012 in Stockholm – one of Scandinavia's most exciting cities. Chairs of the 11th ICORIA are Micael Dahlén and Sara Rosengren from the Stockholm School of Economics. Papers should be submitted before March 15th, 2012 to: papers@icoria.org. The call for paper will be sent out shortly. EAA is looking forward to ICORIA 2012 in Stockholm and a new chapter in the history of ICORIA.